This blog has been a bit quiet because it’s been full-on swarming season in Sydney. This has made a mess of my plans, as I drop everything and rush off to catch bees. With such a warm winter, and plenty of early Spring rain, the bees have all decided to spread out to new homes. Castle Hill: as previously blogged, an easy going swarm in a tree, caught by cutting off the tree branch and shaking into a box. Maroubra: also up a tree, but high enough to make it quite a challenge, with success only coming by nightfall. Ashfield: a prime swarm (the first big swarm from a hive), from a nearby wild beehive in a tree trunk (more on this one later). 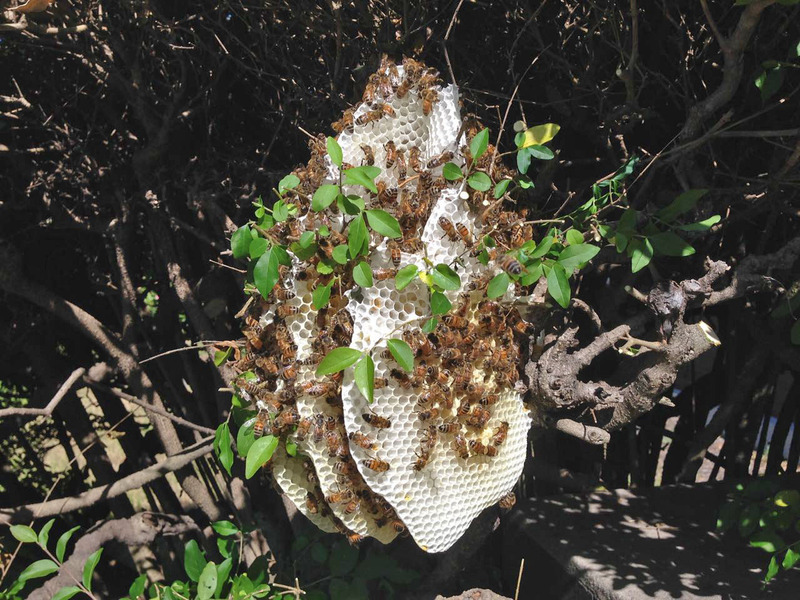 Beaconsfield: a small wild hive — complete with comb — in a bush (see above). This was in the front of a good friend’s house and after trimming the bush, I was able to shake the bees into a box, then take the remaining comb. Next door: a win for my bait hive (see below), catching a good strong swarm. Drummoyne: a wild hive high up in a tree — got stung a lot trying to catch it, and still didn’t get the queen — will have to go back for another try. Ashfield (again): another swarm from the same tree trunk, this time smaller and very conveniently located at chest height. One of my new bait hives, established beside the former convent, next door to our house. Within a fortnight it caught a swarm! This entry was posted in Beekeeping and tagged beekeeping, bees, natural beekeeping, spring, swarms, Warré hive. Priscilla’s recent work trip took her around the world, and across Europe. Taking a break in a park is always a great way to get over jetlag, and in the process she stumbled across a number of marvellous insect hotels. The one above was in Warsaw, while the big art/environmental installation below was in Paris. They’re clearly in fashion at the moment, and they put our insect hotel to shame! Insect hotel meets art installation in Paris. A post by Gerry to the natural beekeeping list also highlight this great Bee walls, habitat and nesting blocks (PDF) resource. This entry was posted in Saving the environment and tagged bees, insect hotel, insect hotels, paris, warsaw. When I started with beekeeping at the beginning of the year, I purchased a set of Warré bee hives from Natural Beekeeping Australia (Tim Malfroy). These are lovely, and made out of 22mm Macrocarpa Cyprus, they’re built to last. In the quiet winter, it’s a good time to plan for the coming spring. I’m hoping to add a second bee hive to the roof, and so a second set of boxes are required. After some helpful advice from Tim, I decided to make my own. Routing a 11mm x 11mm rebate for the frames to sit into. The first step was to rout a 11mm x 11mm rebate into the sides of the boxes, for the frames to sit into. I borrowed a router off a friend, and even with no prior experience, I had the rebates done in about 30-40mins. Sides for one box, ready to be screwed together. Some careful cutting with my circular saw produced the first set of box sides in the first hour, after a bit of initial stuffing around. A completed box, screwed together and ready to go. After a quick dash to the nearby Bunnings to get some clamps big enough to hold the box together, I had the first box screwed together. Repeat three times until a complete set of boxes is created! All that’s left is the base, roof, and quilt box. The completed set of hive parts is shown in the first picture in this post. From a standing start, and with a lot of on-the-job learning, the whole process took about 2/3 of a day. It will be a lot quicker next time around! The radiata pine was the only material I was able to easy source locally. So while it’s a bit thinner and less robust than the cyprus used by Tim, it’s still fine (it’s painted to protect it from the elements). The key thing is to ensure the interior dimensions are 308 x 308 mm, so the frames fit. I used some left-over ply to make the base and lid for the hive. The total cost of materials was approx $120. The tools needed for the job, nothing too unusual. This is pretty much a set of standard tools for the typical DIY’er. Using a circular saw for accurate work is a hassle, but possible. It would be much easier with a good-sized mitre saw, or bench saw. This entry was posted in Beekeeping, Growing our own food and tagged bee hive, beekeeping, bees, natural beekeeping. We’ve had native stingless bees for several years now, and they live very happily in their small home, complete with a tin roof. A very natural home for native stingless bees, at the botanic garden in Sydney. I’m reliably told that the hive on the right is currently empty, awaiting an enthusiastic swarm from the active hive to populate it. Which only leaves the question: how did they get the bees into the first hive? This entry was posted in Native gardens, Saving the environment and tagged bees, native stingless bees. So we put in an order for a “package of bees” from Hornsby Beekeeping Supplies. Last Friday we received a call to say they had come in, and we drove to Hornsby on Saturday morning to pick them up. A “package” of bees is an interesting concept for a novice! As you can see above, it’s a box about the size of a briefcase, with sides of flyscreen. There are approximately 5,000-6,000 bees in the box (!). I waited until late in the day, and then followed the steps to put the bees into the hive. I put on most of my protective gear, but left my gloves off. 15 minutes later, job done, no bee stings! The bees are very docile, mainly because they don’t yet have any territory to protect. They were flying and crawling everywhere, but didn’t want to attack me. What happens now? The queen bee is kept in her cage by a plug of sugar. The bees eat through the plug and release her in about three days, and by then they should’ve bonded. Then they start setting up the hive, and creating the honeycomb. Close-up of the “package” of bees. That’s a lot of bees! This entry was posted in Beekeeping, Growing our own food, Saving the environment and tagged beekeeping, bees, natural beekeeping.